Tuesday, June 25 through Sunday, June 30 2019. Early Registration Deadline is April 15. Save $$$! Drop-Dead Registration Deadline is May 15. After May 15, You're standby on a space available basis. We will be building homes and latrines West of Tecate. We will be staying at the 'rustic' Rancho La Paloma Ministry Center, in Tecate. You can take a look at the ranch by visiting their web site at www.RanchoLaPaloma.org. If you want a better fix on the location, click here for the maps. Please send full payment with your completed application by the above dates for any discounts to be effective. If paying by credit card, click on the PAYMENTS link to the left for additional instructions. The registration fees above cover your transportation from/to San Diego airport, the cost of your rustic accommodations, all meals while in Mexico and a trip T-Shirt. It does NOT cover your airfare to/from San Diego, nor your Sunday lunch meal. it does NOT cover any part of the cost of materials for the homes. In addition to the necessary fee listed above, we encourage you (as an individual, a church group or a corporation) to partner with us and donate financially towards the cost of materials used in constructing these homes. 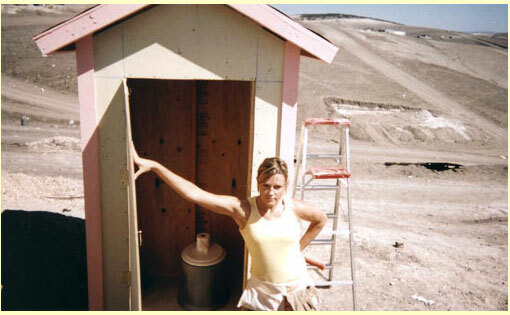 The house, latrine and cement pad and labor cost approximately $9,400.00. All donations are 100% tax deductible. You can donate funds when you fill out the registration form, or at any time by clicking on this link to our support web page. Google Map link to the orientation meeting location. You are responsible for booking your passage to and from San Diego. Your flight TO San Diego should arrive before 2 pm on Tuesday. Your flight FROM San Diego should depart after 4 pm on Sunday. Our assembly point is now at the curb, outside of ALASKA AIRLINES check-in, TERMINAL-1. From Baggage Claim at TERMINAL-1, exit to the curb and walk west (same direction as traffic) to the west end of TERMINAL-1. This airport map shows the pickup location. Check-In starts at 1 p.m. We leave at 3 p.m. sharp! Here is an online Google Map for the assembly point at the airport. We leave from San Diego Airport Terminal 1 Parking Lot, next to the palm trees. Dinner will be served at the Ranch in Tecate, Mexico by 7:00 pm. Meetings follow dinner. Get up at 5:30 am, eat breakfast, have group devotions. Leave for work site by 7:00 am. Work hard all day. Lunch is provided at work site. Stop work at 4:00 pm, back at ranch around 5:30 pm. Clean up, swim and eat delicious Mexican dinner at the ranch. Stumble into bed exhausted and happy. Sleep in till 6:30 am, eat breakfast, pack up and load all gear. Visit kids at orphanage, distribute donations, hike to park, tour local village. return to ranch and eat a fabulous Mexican dinner. Sleep in till 6:30 am, eat breakfast. Have worship and sharing service, leave ranch at 10.00 am. Cross border, arrive at airport by 2:00 pm. Here is a list of items that you will need to bring with you. You HAVE to register on our online registration system. ClubRust has NO insurance. Make sure you are adequately covered during the trip. You ARE REQUIRED to sign all releases/waivers. If you have no insurance in the U.S., you ARE REQUIRED to purchase temporary insurance. Follow this link for a company that sells temporary trip insurance. ClubRust is Christ centered, and is open to anyone with a good attitude. Smaller ad-hoc trips happen whenever a project arises and a group of volunteers are available to do it. Besides building homes and latrines, we maintain the ranch where we stay, and assist other groups and organizations with their projects in Mexico. See the Ranch website at www.rancholapaloma.org and read about the Ranch service projects. To participate, please contact us.